Our 2017 conference took place from 13-15th October at The Midland Hotel, Manchester. The theme was 'A Wider Perspective' - looking at how mental health can be affected by outside influences such as physical health. 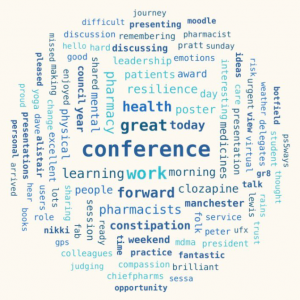 "Brilliant weekend"; "fantastic conference". "Fab conference"
"Lots of ideas for posters running through my brain after the last 3 days." "Thanks for the session from Dan White, skilfully helping room of pharmacists to grow skills around disclosure of suicide." CMHP 2017 - Flashback from CMHP Communications on Vimeo.